With our Newtown original well-established as a local favourite, we now bring the Continental Deli to the city. Founded by Elvis Abrahanowicz and Joe Valore of Porteño, and Jesse Warkentin and Michael Nicolian (of Bodega and Gardel’s Bar). Continental is the realised passion for a neighbourhood deli. Bring your basket to purchase your specialty deli essentials, be it charcuterie for your next days sandwich, fromage for a friend, or all the elements for a perfect picnic. We have sourced what we consider the most interesting, rare and delicious cheeses and charcuterie as well as an impressive range of tinned delicacies; anchovies from the Bay of Biscay, clams and cockles from Galicia, sardines from France. We are however most proud of the items we have canned ourselves from incredible local produce. You can expect to see many of our most popular dishes, our in house tinned seafood, our famous tinned cocktails as well many new dishes to try. Noise obliterated the pleasure of dining and would return only if less noisy ! Everything is always on point at the Continental, I'm a regular at the Newtown and wanted to go try the CBD store. The wait staff were friendly and helpful, paid attention to detail. The food was delicious as excepted and we had a lovely evening, I would definitely recommend it to a friend. Would go to the Newtown one if trying again. Went for the French dip sandwich - told this isn’t done on the weekend, this isn’t advertised anywhere. Atmosphere negative as in a dead part of the CBD. Interesting menu and very tasty. The staff were very helpful as we were on a tight schedule. Lunch with an Alumna. Great time. Good food. Beef tartare always good. Delicious friendly and stylish . Already sending more people to try. Why should the law firms nearby have all the pleasure. This is a much needed addition to the center of the Sydney’s eating places. The food is magnificent (although a few more occasional additions to the menu would be welcome), the wine list is amazing and the staff are simply wonderful. I wholeheartedly recommend Continental to anyone looking for a casual first rate dining experience. I’m gonna recommend all my friends to stay away from this place. Overpriced, pretentious food, noisy and overall unpleasant environment. downfall was the lag in food. We were on a business lunch and were there for 2 hours when we should have been there for 1 as the food took so long to come out. Think they forgot the steak as it came out 20 minutes after all the rest of the food. Very nice server and delicious food. My friends and I opted for the tasting menu and we were all more than satisfied by the end. My favourite dish was the Cucumber Newyorkése with stracciatella and dill, but every dish was delicious and the portions were ample. (Indeed, we struggled somewhat with dessert.) Our cocktails were impeccable and we couldn't fault the service either. Many thanks to Mikey and the team for a splendid evening. My first visit. Thoroughly enjoyable. Good food. Good wine. Good company. And you can watch people you know walking by in Phillip Street!! This is a great destination for a quick lunch, however the table we were seated at was right beside a couple of gentlemen talking very loudly. The food is very good and the service is attentive and friendly. Great food, drinks, service and atmosphere. Highly recommend. Love the concept. The tinned food and drinks are so good. Great food and wine selection. Cocktails are also lovely. The only thing I would say is it is quite noisy, when you seat on a round table it is almost impossible to talk to people in front of you. 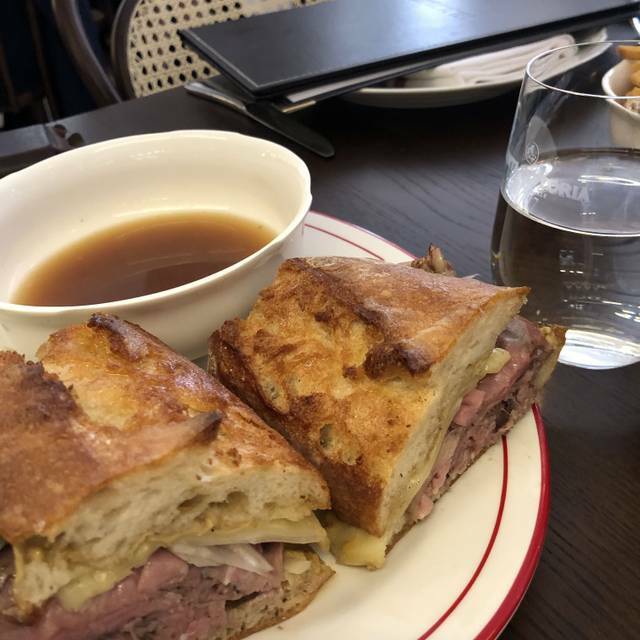 The French Dip sandwich is great. Will be going back just for that. My only issue was that all the pasta that was served was a really odd lukewarm. Food was nice enough, I think better for charcuterie style eating. Steak tartare was great. Banquet was great! Very nice wine list too. Definitely recommend. Great to see this Newtown staple in the CBD and closer to the east end of town, thrilled to see Continental Deli land here. Would have given it a five-star review, if not for the noise levels but that seems to be my perennial complaint about Sydney restaurants. Loud does not equal a great ambience. The food was delicious which is the jewel in the crown and will see me coming back, as well as the convenient (for me) location. Love the food and atmosphere but the noise level makes it hard to dine with more than 1 other person. Everything is bang on as I was expecting. 'll be back. All class! Great service and good, simple food served quickly - perfect for lunch during the work week. Strangest service from this waiter with blonde hair. "we don't have tomato sauce", he said as if I offended him by asking for tomato sauce with chips. I'm sorry, we're not in Paris here, what kind of restaurant in Sydney has no tomato sauce? He had a very put on air about him. Turned me off coming back in. Sensational charcuterie platter, sandwiches were awesome and the bread was to die for. Loved the pasta with XO sauce and salami. Food was excellent and the wine list caters for a range of tastes. Will be back! Inspired menu. Inventive use of simple but good produce. Decadent flavors without the fussiness. A little more attention to tables by waitstaff would be nice, and a little more to dessert than scoops of ice cream. Another great dining venue from the crew. A menu for everyone, and an atmosphere that perfectly fits. Amazing food in a great location. Very difficult to hear people with the noise levels from the concrete floors. Everything you'd expect from this team of experts! A fantastic spread and variety of food, served by fantastic staff in amazing surroundings.